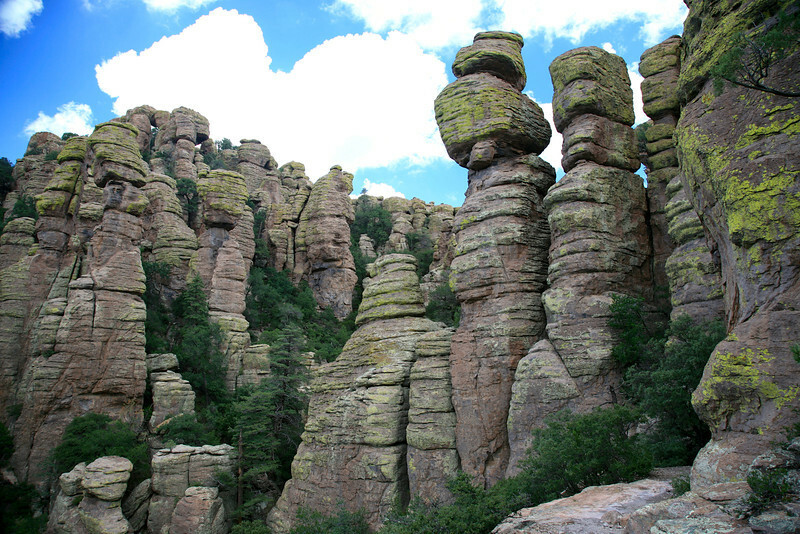 The stone formations in Chiricahua National Monument look like stone soldiers marching down the mountain. We’re often asked about our favorite off-the-beaten-path travel experiences. In Arizona, that would have to be Chiricahua National Monument. Whether camping or RVing in Bonita Canyon campground or staying at nearby Sunglow Ranch, active travelers will get their fill of hikes, 4-wheel driving, exploring history or photographing the scenery in a less-crowded southeastern Arizona setting. 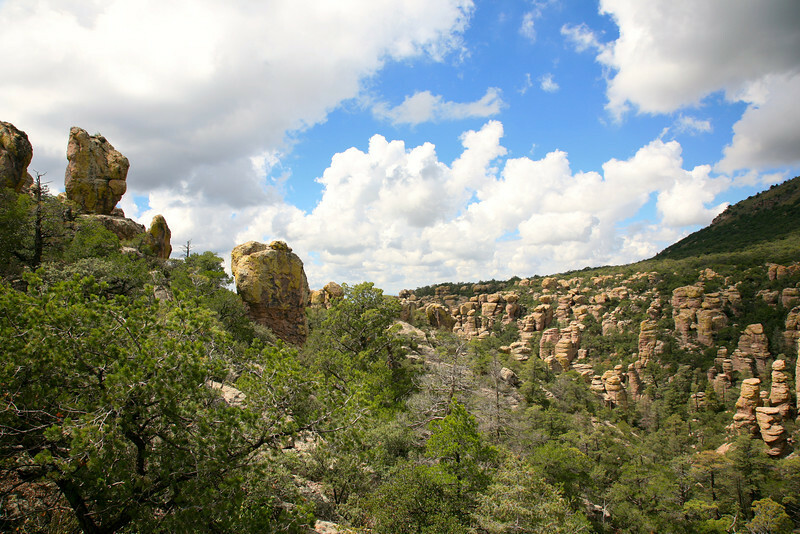 Hiking on Echo Canyon Loop in Chiricahua National Monument. The Apache’s called this part of their homeland, “Land of Standing-Up Rocks.” To see what they mean, drive the eight-mile journey up Bonita Canyon Road to Massai Point (6870 ft.) for an introduction to Chiricahua mountain scenery punctuated with columns of rhyolite marching down the hillsides. Alan and I enjoy hiking Echo Canyon Loop, a 3.3 mile trail that loops through the rock formations giving an up close and personal view. Another option is to park your car in the Visitors Center lot, take the 8:30 a.m. shuttle to the top and hike Echo Canyon Trail (4.2 miles) back to the Visitors Center. Of course Alan likes to test his 4-wheel drive skills on Pinery Canyon Road. It’s really just a wash-board rough gravel road that takes you up and over the Chiricahuas to the small community of Portal on the other side. Be sure to take a break near the top, at Rustler Park, to rest under the tall pine trees. From here, you can see well into Mexico. During monsoon season, this road becomes challenging so check conditions first before starting out. Back in the monument, history lovers glimpse life on a homestead at Faraway Ranch near Bonita Canyon Campground. Swedish immigrants built the ranch in the 1880’s. Explore the grounds on your own or book a tour at the Visitor’s Center. And while visiting this part of Arizona, take the short drive to Fort Bowie near Apache Pass to walk around and imagine life in the old west. When visiting desert destinations, go early to avoid the heat of the day. You’ll have much more fun. Bring extra water, too! 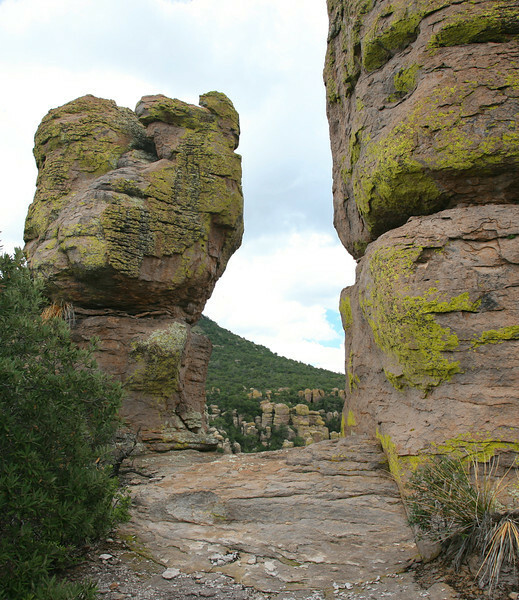 Have you visited Chiricahua National Monument? Join the conversation at the My Itchy Travel Feet page on Facebook or send us an email to ask a question or share your experience.